Why Serving an Evening Snack is a Good Idea! Sometime many years ago a very famous women told the world that they shouldn’t eat after 7pm – meaning you should eliminate evening snacks. The response- the world felt guilty eating after 7pm. The truth – there is nothing wrong with eating after 7pm. And even more importantly, it’s almost essential for children. Has anyone ever planned out a great dinner, served it on the table only to be met with resistance to the meal? You are freaking out because you know if they don’t eat dinner they will go to bed hungry. That doesn’t seem like a good option either. Of course you want to try to pressure them to eat more. Then 1 hour after the meal is over your child comes to you complaining they are hungry. You know if they would have just eaten some dinner they wouldn’t be so hungry. You feel guilty about sending them to bed hungry. Truth be told dinner is often the hardest meal for kids. They’ve probably already consumed at least 75% (if not more) of their nutritional needs, they are tired and cranky, and dinner typically has the most challenging food. 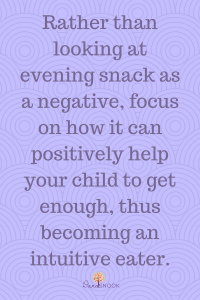 This is exactly why I believe an evening snack is so important. 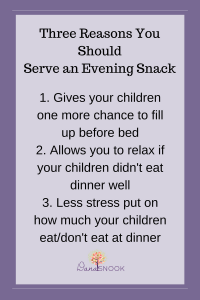 It will help to take the stress away from the dinner table and make sure your child doesn’t go to bed hungry. If I’m always serving a snack after dinner, won’t they not eat dinner well? This is often a concern for parents, but what I’ve found is that it helps our children be more intuitive eaters. The truth is, if you serve a really challenging meal they may eat less dinner knowing a snack is coming, but I believe this helps to prepare them for life. Have you ever been to a dinner party and you didn’t really like anything they had – isn’t it reassuring to know that when you get home you can have something you like better? Your children will feel the same way. If they aren’t the biggest fan of dinner – they will know they have one more chance to eat. This will prevent the I’m starving meltdowns. We all know what “hangry” looks like and it ain’t pretty! Does evening snack always have to be dessert? This usually leads into the second most common questions I get. Should evening snack always be dessert? My answer is: It doesn’t have to be, but it can be if you choose for it to be. Rest assured though, if your child knows that every evening snack is dessert they will definitely be saving room for that. I mean, who doesn’t love dessert right? However, you can vary evening snack. Maybe sometimes it is dessert type food and maybe sometimes it is a different type of snack. I highly recommend you let your children know what snack will be of the night. This might mean having a wipe board that you write what is being served for dinner and snack each night or even throw a piece of paper on the fridge so they know. (Hint: Kids love visuals – they love knowing what meals and snacks are coming). The other reason: Let’s say you are serving chicken, rice and broccoli for dinner and list snack as apples and peanut butter. If apples and peanut butter are not their favorite they are more likely to fill up on more dinner. However, if ice cream and pretzels are being served for snack and it’s there favorite, they are more likely to “save room” for the snack. Some parents might argue, “why would we want them to eat less dinner and save room for dessert?” We want them to grow up to be intuitive eaters. The reality is if ice cream is for dessert and they must eat a certain amount of dinner to “earn” dessert then they will push past the feeling of fullness to “get” dessert. This is essentially teaching them to overate. However, on the reverse if they leave room for dessert and then finish filling up on dessert, they are listening to their body and getting exactly what and how much their body needs. You can check out my blog post about raising an intuitive eater with all foods if you want to read more about this. There isn’t much time between dinner and bed. When children are young there isn’t often a lot of time between dinner and bed. Nonetheless, even if there is an hour, I would try to start implementing this. If you have a toddler weaning from the bottle , this is a great time to start serving milk to help with getting off the bottle. If you have a picky eater it’s one more opportunity to allow them to eat something. Lastly, when you are working implementing the Division or Responsibility of Feeding, it really does help if they are struggling with the process. What is your biggest battle with evening snack? Do you struggle with what to serve?